San Diego is a city by the sea, and in a seaside town, you would expect a museum dedicated to great ships and the sailors who called them home. The Maritime Museum of San Diego on the San Diego Bay Embarcadero fits that description. The museum restores, maintains, and operates historic vessels. The exhibits are great for people of all ages; younger children will certainly have a great time exploring the various historic ships. The Maritime Museum is a combined exhibit of ten ships and a variety of exhibits. The most famous of its ships is the Star of India. This ship, built in 1863, is the world’s oldest active sailing ship. It is taken out for ocean sailing each November by a volunteer sailing crew. Another important ship in the collection is the Berkeley. The Berkeley is steam ferryboat built in 1898 that operated for 60 years on San Francisco Bay. The Berkeley houses the museum’s offices, a large maritime research library, the museum gift store, and a special events area. The museum is also currently building a replica of the San Salvador, one of the first boats to enter San Diego Bay, the flagship vessel of Juan Rodriguez Cabrillo’s expedition to explore the west coast of America. The ship is being constructed in full public view and will become part of the museum’s collection when it is completed. It is best to allow approximately two hours to fully appreciate and enjoy all the exhibits. To explore the interiors of the various ships, expect to do some climbing. The hours of operation are 9:00 AM until 8 PM every day of the year. As of February 2011, tickets were $12 for adults, $10 for seniors and students, and $7 for children, 6-12 years old. Fees are subject to change. Tickets for a sailing adventure on the tall ship Californian can also be purchased for anyone who enjoys the salt air and open seas. The Californian, built in 1984, is a replica of an 1847 sailing vessel that patrolled the coast of California during the gold rush. There are also many other activities, events, and displays throughout the year. The Maritime Museum of San Diego is located along San Diego’s beautiful waterfront. The scenic boardwalk, called the Embarcadero, extends from the Maritime Museum south to the Embarcadero Marina. There are various points of interest along the Embarcadero, including the Urban Tree Sculptures, Convention Center, Seaport Village, the USS Midway Museum, and the cruise ship terminal. Also along the scenic Embarcadero are several war memorials, including the National Salute to Bob Hope and the Military, the Aircraft Carrier Memorial, and the Battle of Leyte Gulf Memorial. If hunger sets in, or the urge to shop overwhelms, there are various gifts shops and restaurants along the way. Not far from the boardwalk is Petco Park, home of the San Diego Padres and the Gaslamp Quarter. Getting to the museum is a breeze. There is a trolley stop only two blocks away. For those who drive, there is plenty of parking located within a few blocks of the museum. 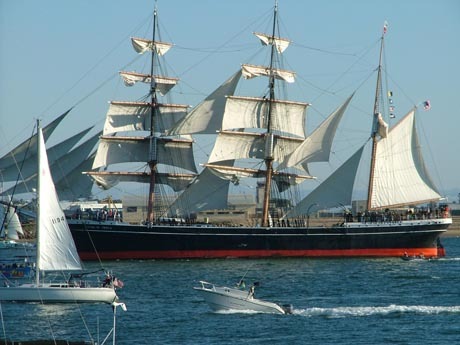 The Maritime Museum of San Diego is a must-see attraction for both visitors and tourists. There is plenty to see and do for the entire family. The museum is surrounded by parks, shopping, restaurants, hotels, and other attractions. It’s located in the heart of a beautiful city and should be a required stop on any San Diego vacation. The Maritime Museum of San Diego is located on Harbor Drive near the corner of Ash Street just a few blocks West of interstate 5. From interstate 5 North or South take the "Airport" exit. Look for signs on the freeway and after exiting on to surface streets that read "Embarcadero-Maritime Museum." They will direct you to the museum.